In the morning of July 6, China (Datong) International Automobile Culture Festival promotion conference held in Datong Great Palace Hotel. Liu Zhenguo, vice mayor of Datong, Peng Mingjing, deputy party secretary of CNAICO attended the conference. Organizing committees made a general introduction on the auto culture festival and introduced their publicity plan. On the conference, many car dealers showed great interest with the cultural festival, and planed to participate in it. From August 23 to 26, the four-day Auto Culture Festival will make full use of the 20,000 ㎡in Datong’s south city wall, east and west ear wall, Yue City and Weng City to held the auto show and related activities. By then, more than 40 luxury cars, new energy heavy truck, RV, classic cars, passenger cars, pickup trucks and other famous brand will appear in the auto exhibition. At the same time, a series of activities will be organized during the auto cultural festival, including car and motorcycle stunts, car parade, car model competition, photography competition, hundred years of automotive history exhibition, etc. Deputy party secretary Peng Mingjing introduced the general information of CNAICO, especially the implementation of the company's exhibition business in his speech. He said that, as the biggest and the most influential state-own enterprise in China, CNAICO has advanced exhibition concept and professional exhibition team, which represent it has ability and confidence to hold The 1st Datong International Automobile Culture Festival successfully. Datong’s vice mayor Liu Zhenguo pointed that; this festival would play a positive role on the display of Datong’s history and culture, and the development of cultural industry. Consequently, the government of Datong would make every effort to support the auto culture festival, and strive to accomplish this festival a classic, stylish, distinctive cultural festival. 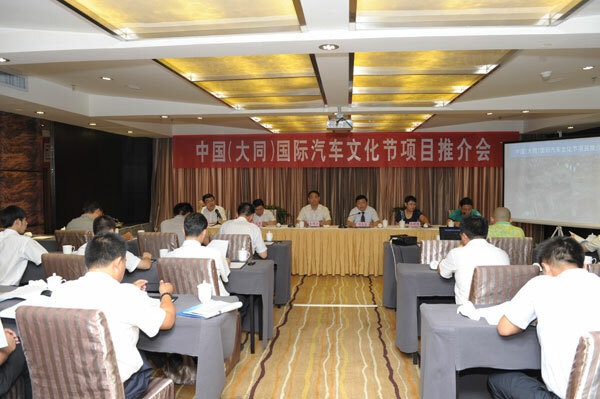 Wang Zhijun, Deputy Secretary of Datong’s Municipal Committee, Wang Xiaoya, general manager of Datong Daily Media, Hao Yuejin, executive vice president of Datong Daily, Cao Yanfeng, general manager of Datong Daily Media and 70 journalists and car dealers also attended the conference.